Reflecting major developments in solar energy since the publication of the last edition, Principles of Solar Engineering, Third Edition follows the changes in energy policies that have led to the rapid growth of solar energy systems. This latest edition focuses on the fundamentals and the design of systems for various applications including building, heating and cooling, industrial process heat, electric power plants (including PV and CSP), and environmental systems. The third edition introduces new topics that include organic and dye sensitized solar cells in the photovoltaics chapter, advanced thermodynamic power cycles such as supercritical CO2 cycle and information on design software packages. The chapters on solar radiation and solar thermal collectors have been completely changed. Because of its increased importance, solar thermal power is covered in much more depth than in the previous edition. The book contains increased coverage of high temperature thermal storage for CSP in the chapter for energy storage and transport. It changes many end-of-chapter problems, provides examples and problems for both northern and southern hemispheres and countries around the world, includes a solutions manual, and revises the retained material. A significant change in the new edition is the addition of economic analysis in the first chapter, which includes a number of solved examples, and allows the students to analyze the applications in the later chapters from an economic stand point. 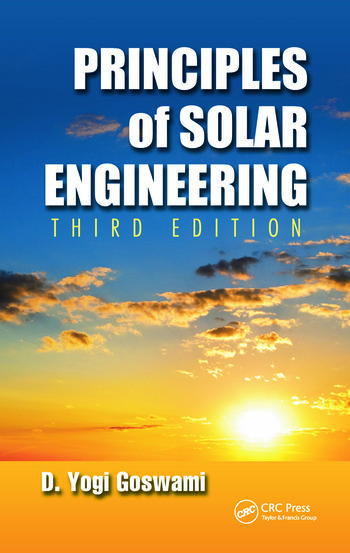 Principles of Solar Engineering, Third Edition addresses the need for solar resource assessment, and highlights improvements and advancements involving photovoltaics and solar thermal technologies, grid power, and energy storage. Dr. D. Yogi Goswami is a distinguished university professor and director of the Clean Energy Research Center at the University of South Florida. He conducts fundamental and applied research on solar thermal power and cooling, photocatalytic detoxification and disinfection, thermodynamics, third-generation photovoltaics, and hydrogen production and storage. Professor Goswami is the editor in chief of Solar Energy and Progress in Solar Energy. He has published as an author or editor 17 books and more than 350 refereed technical papers. He also holds 16 patents, some of which have been successfully commercialized. "The book is an excellent source of high quality information on current and advanced technological topics on solar energy. I intend to upgrade the textbook for my solar energy classes, by replacing the current 2nd edition with the 3rd edition of this book." "This is a book written by one of the prominent experts in solar engineering. The treatment of the design and analysis of solar thermal heating and power generating systems is thorough and unparalleled." "The authors have done a nice job updating this edition of their classic textbook by enhancing the chapter on photovolaics and by including more recent advances in solar thermal power technologies such as the supercritical Rankine cycle and the supercritical C02 power cycle." "The organization of the book seems much better than the second edition… The present chapter eight is a great piece of work, which provides many details in solar thermal power design. To my best knowledge, no other textbook on solar engineering can compete with this book regarding this topic."